Cody Willoughby | Piqua Daily Call Science instructor Veronica Gaier assists, from left, fifth graders Gavin Larger, Carter Davis, Camryn Best, and Sofie Elliott during “Hour of Code” on Thursday at Piqua Central Intermediate School. Cody Willoughby | Piqua Daily Call Fourth grader Tavian Tousley and fifth grader Jesse Baker engage in coding activities during “Hour of Code” on Thursday at Piqua Central Intermediate School. Cody Willoughby | Piqua Daily Call Fifth grader Madison Haworth and fourth grader Rylee Weldon choose an educational game during “Hour of Code” on Thursday at Piqua Central Intermediate School. PIQUA — Digital proficiency was the true name of the game for 65 participating fourth, fifth, and sixth graders during Piqua Central Intermediate’s annual “Hour of Code” event on Thursday afternoon. This marks the fourth year that Piqua Central has held the event. Dec. 3-9 is being recognized internationally as 2018’s Computer Science Education Week, and many organizations, including Piqua Central, feature Hour of Code to coincide with the occasion. Throughout the 60-minute session, participating students engaged in Code.org’s courses, set up as interactive games, to teach students computational thinking, problem solving, programming concepts, and digital citizenship. With the current generation of elementary students engaging more regularly with digital technology than any generation prior, Gaier feels that tools like Hour of Code aren’t just useful, but also essential. Gaier also stressed that fourth, fifth, and sixth grade is the perfect time to introduce students to a concept like coding, given their growing tendency for critical thinking and exploration. “The games are created for age 4-99, but at this age, they can make more rational decisions than the younger kids,” Gaier said. “I do believe this is a pivotal time, because these kids are figuring out who they are, how technology fits into their life, and how to use it purposefully. All equipment utilized during the program was provided by Piqua City Schools. Hour of Code is a movement active in over 180 countries, with over 209,000 coding events registered in 2018. For more information, visit www.hourofocode.com. 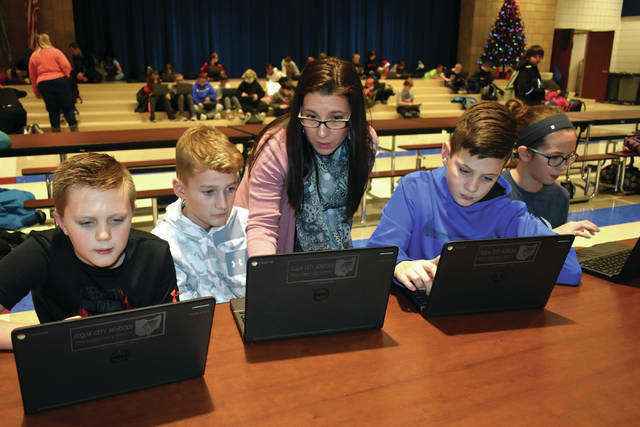 https://www.dailycall.com/wp-content/uploads/sites/30/2018/12/web1_HourofCode1.jpgCody Willoughby | Piqua Daily Call Science instructor Veronica Gaier assists, from left, fifth graders Gavin Larger, Carter Davis, Camryn Best, and Sofie Elliott during “Hour of Code” on Thursday at Piqua Central Intermediate School. 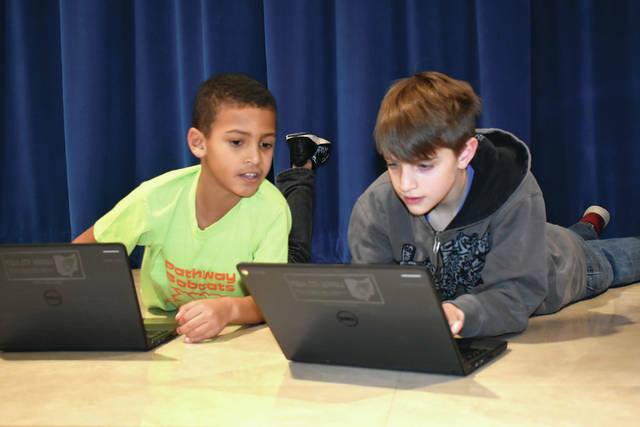 https://www.dailycall.com/wp-content/uploads/sites/30/2018/12/web1_HourofCode2.jpgCody Willoughby | Piqua Daily Call Fourth grader Tavian Tousley and fifth grader Jesse Baker engage in coding activities during “Hour of Code” on Thursday at Piqua Central Intermediate School. 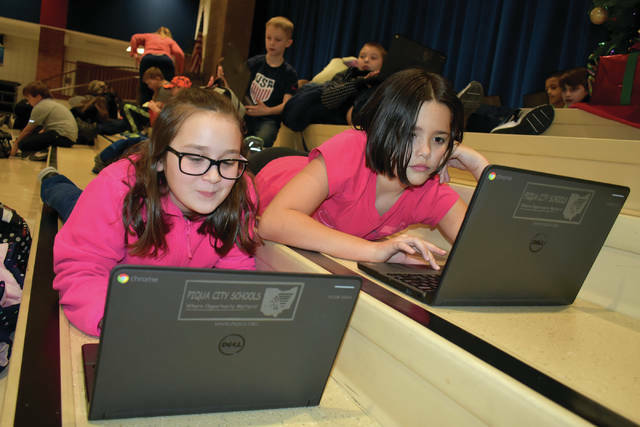 https://www.dailycall.com/wp-content/uploads/sites/30/2018/12/web1_HourofCode3.jpgCody Willoughby | Piqua Daily Call Fifth grader Madison Haworth and fourth grader Rylee Weldon choose an educational game during “Hour of Code” on Thursday at Piqua Central Intermediate School.